1/10盎司2017年墨西哥自由心证鹰币 Buy this sought after 1/10 oz Libertad silver coin at the best price online, one of the smallest fractional silver coins available today. 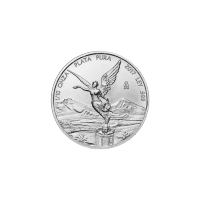 Minted by the Casa de Moneda de Mexico in limited quantity and issued annually since 1991, the 1/10 oz Mexican Libertad Silver Coin is one of the most popular bullion coins in the world. The obverse of the coin shows the national seal of Mexico, with the eagle representing Mexico and the snake representing Spain. The reverse depicts a winged Angel of the Mexican Independence Victory Column in front of a landscape with the volcanoes Popocatépetl and Iztaccihuatl. The Mexican Mint is the oldest mint in the Americas and was established in 1535. The interesting fact about this mint is that its silver eight-real coins and later on the silver peso became the basis of the modern national currencies of many countries in this part of the world, including the US dollar, Chinese yuan and Japanese yen. Another interesting fact related to this part of the world is that the widely used $ symbol used to represent the Spanish American Peso during 1770s, also known as Spanish dollar, in British North America, and was later on used as a model for the currency adopted by the United States in 1785.